OK, will this qualify me for membership?? I think that we have a winner! Al..you are the man...that costume...both of them are AWSOME!!!!!!!! Classic BSG is IT!!!!!!! Love the costume! Mind if I ask the source? Oh and we will definitely be keeping this thing a tad simpler than the 501st. As of now, we're definitely going to be in the same spirit but we sort of trimmed it up. I think this is most definitely going to be a lot of fun. We may not have the numbers of the 501st, but that sort of goes with the underdog spirit of the rag tag fleet! Plus it'll be easier to get to know everyone. I just can't wait for that first group photo. By the way Charybdis, that fan film you did was great! I'm hoping that this club will help with similar ventures. Thanks guys! I definitely expect some of you to star in some of my upcoming adventures aboard the Callisto!!! As for the costume, the jacket is an old JK2 model which I got back in 1998 just before Kathy Pillsbury and Joseph Kerezman broke up the company. The actual uniform itself was originally ordered through JK2 but I got caught in the breakup. Kathy Pillsbury did the costume for me on her own and it is excellent. I don't know the source of the items, but the prices aren't bad (relatively speaking). If folks aren't capable of doing their own, it might not be a bad idea. The only items that would need to be found or made would be the uniform belts and the boots. From the pricing on the website and comparing them with the pricing on BSG.org's website, that may indeed be the originating source. Just a suggestions - I've been keeping the webpage for the site on my PC for future use when I have the funds available. I also wonder if they use the same source or if they purchase them and then resell them? An email to them might reveal some interesting information. At least there are vendors out there still selling the stuff! BSG.org and Monsters in Motion are great resources. Anyone have any other links they know of? Reaper already came up with a uniform resource I had no idea about (costume base). Mieal Deneb is working on patterns as well! By the time we get all these resources together we'll have a list that works with a wide variety of budgets from about $200.00 (full costume) to $600.00. In all fairness, we do want to have some costume standards in place. Charybdis' costume is a great example of the quality we are hoping for! The cheaper costumes definitely reflect the price, but we'd rather have someone involved than not. Therefore we'll probably have a "rank" limit for those costumes. The Katarra, BSG.org, Monsters in Motion, and other uniforms of similar quality should be considered the higher quality and I think our ultimate goal. Bravo Monolith!!! And all the Rest!!! This is EXACTLY what needs to be around here. 1 - Detailed Measurements and reference material for the Helmets (for the more "adventerous" who wish to embark on creating one.) Also Patterns and reference for the Tunics and Jackets. I know you guys have probably already discussed this, so if it's in the works disregards my meddlng. Thanks man! Truth be told, Reaper, Mieal Deneb, and Kronus have been the ones "in the know" and deserve most of the credit for getting us this far. Actually, a system of rating for costumes isn't a bad idea. For points of reference it would be good to do side by side pictures. I'd say your costume Charybdis as a reference for screen accurate. The "AF blue vs. Steel grey" belts vary according to taste and opinion. So lets say for a point of reference that is an A. BSG.org's uniforms would count as maybe A-. I'll post some uniform resources in another thread with prices and ratings just by my opinion. Maybe someone can vouch for a uniforms that I may think is pretty off. OK, here is Col. Charybdis planetside just to whet your appetites!! I'm glad to see and it is worthy to note that the Battlestar Galactica.org bridge crew uniforms do not seem as blue as they do in their site's pictures. Seems a bit more accurate than I thought it would be. Cool! Don't mind me if I stay on the side and shout encouragement?? Yeah, I put down costume base because the quality seems about the same and to avoid the other issues with the whole Universal Armorer thing. I can't really think of any other costume where the lighting makes such a difference than on Battlestar. You quite literally have to choose between what you see on screen and what actually was...and even then the right colors aren't easy to find. I'm going for as screen accurate as I can. I was hoping in the beginning that we could come up with some official colors to that we would all match as closely as possible, but that really isn't fair to the people who already have their uniforms. In the end I'd just rather see a bunch of people in uniform! I have to agree, coplor matching between those that have and those who don't will be near impossible. then you have people working on their own costumes, People buying from places such as BSG.Org, and the handful of other people who sell the costume. What we can do to try and get as many matched as possible is listing the material, and colors that the "home made" costumers are using and recommend that to others. When I first saw the post about "grading" the costumes, I kind of winced a bit. Then I saw the discussion turn in a better direction when people realized that with costumes coming from different sources, that it's just not practical to set a benchmark or standard in terms of construction, materials, etc. As someone pointed out, there are folks that have made their own, others that have bought theirs from a few semi-professional sources and then there are those that have yet to either make or buy theirs. As for costumes that are purchased from someone else that makes them, if they got it from someone that still makes them, by all means, post links to that source and provide pricing info. For those that have already made them, if you have patterns, fabric sources or any other info, also pass those on here to those that would benefit from your experience. Generally speaking, the uniform pants are a pretty easy deal as they are just a standard pants pattern without any pockets. I notice tailoring seams on original series costumes on the backside to make them fit properly, but that's the only real variance from the original pattern. The shirt pattern for the most part is also pretty standard, it's the front placket with the padding and seams that's the most work, along with the collar. I remember a friend of mine doing quite a bit of measuring and practicing on cheap fabric to come up with a proper fit for the collar as it has a "pie slice" design to it and you want it to look right. The jacket itself is also pretty standard in a basic sense, but with all the "patchwork" pieces and piping in various areas, it's a fair bit of work. I've seen some homemade jackets that look terrific and others that look all droopy and don't fit right. If I was going to spend money on having something pre-made, it would probably be the jacket. As for the uniform itself, once the patterns are sorted out and the right kind of fabrics have been sources, if you know someone that's willing to make a custom fit uniform if you provide all the materials, that would be the best option. If you have the skills and the time, the satisfaction of making your own can be a lot of fun. In the end, being happy with the result and how it looks and makes you feel is what's most important. I agree, the color match thing would be a nightmare. About the only thing I can think of is coming up with a list of suggested resources for the material and what not. I count my current jacket as outside canon. The shell material is nearly as dark as the shoulders. It is still a very well made piece, and I think things like this will definitely fit into the club. Some degree of uniformity is a necessary, but I think we have a lot of room within that. If you look at pictures from Galacticon 2003 of fans in costume, there is quite a bit of color variance, but nothing all that drastic. Something as dark as my jacket for example, would stick out like a sore thumb! I think that is a good guide line, keep it within reason. It may not be exact, but ball park unless it is a "Special Ops" type uniforms that goes outside of canon. I think it would be hilarious to have a bunch of us show up in all white uniforms as well. I think I'd look Dreamy in white!!! That article definitely has a lot of great info in it. I think the only thing that has really been debunked from that article is the Ultrasuede. Chris Pappas wrote up an equally informative post over at the RPF that had a pretty interesting idea as to why the Ultrasuede myth began in the first place. If we're lucky maybe he'll re-post some of that info here. Buttersuede is an almost exact match. However, a few years ago they stopped making it in the correct color. It is certainly cheaper than the Ultrasuede. The tan is a tad light for the pants and tunic, but definitely looks close. The brown is the darker material my jacket was made out of. You can see a picture of it over in the uniform resource thread. Now, having said that...I think it would be awesome to make a jacket out of Ultrasuede! There was a guy a few years back doing them that way and they looked sharp! However it would cost close to two hundred bucks in materials. I'm not wearing the bell bottoms man. I won't do it. Yeah, I'm not either, but it would be easier to find plain white pants and a White long sleeve T-Shirt to wear under the correct white jacket. I'd still blouse the boots, which means white boots lol. ok, The initial Squadroin forums are up and we invite everyone to joint he forums ther as well. Not that discussions will end here. I'm not too sure about that "buttersuede" fabric. I went to a Hancock Fabrics at lunch today and took a look at it. The fabric has a stretch to it and is really too lightweight for this kind of use. It might be okay for a uniform shirt, but the fabric is overly soft and very lightweight - not to mention the fact you can't find the right color. As for the debunking of Ultrasuede - back in 1978, Ultrasuede was a very new fabric that is produced in a variety of colors and fabric weights. 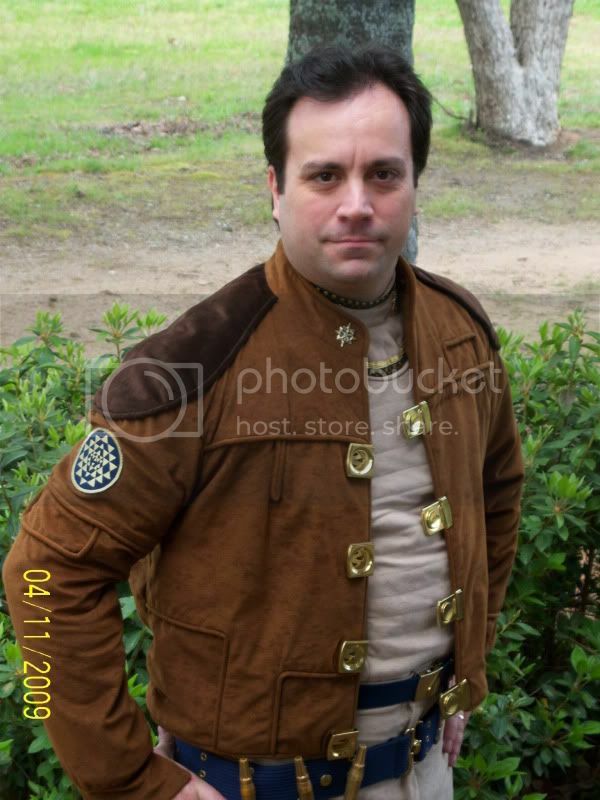 When BSG first came out, most of the people I knew that were making their own costumes were using Ultrasuede as their fabric of choice for the jackets, uniforms, capes, etc. Ultrasuede wears very well, does not stretch, does not sag and it has the right texture. Ultrasuede is actually the forerunner of microfiber fabrics that are used quite extensively today. One of the best features of Ultrasuede is that it is machine washable, but still maintains it's texture and color if you wash it according to the recommended instructions. 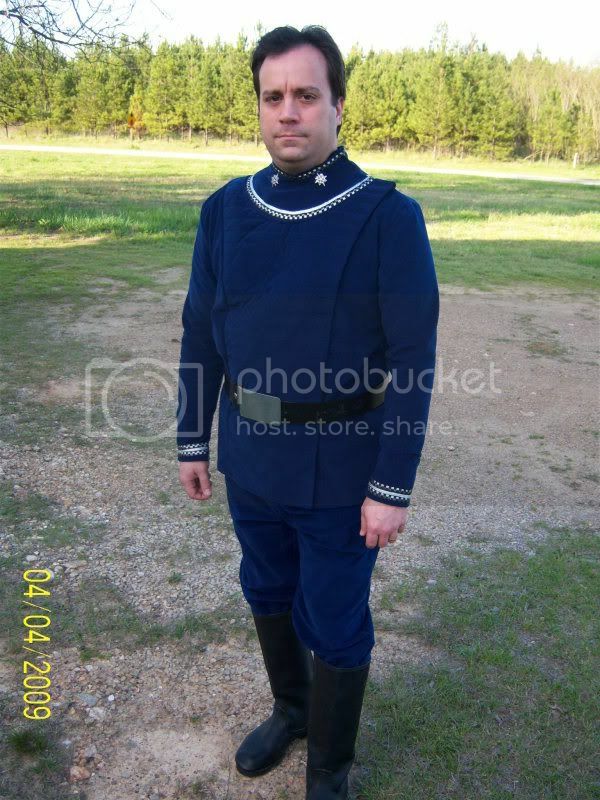 I remember buying some blue Ultrasuede to make a bridge uniform back in 1979. The color was a nice dark midnight blue and the texture was perfect, but the costume never got made and the fabric found its way into other hands for lack of use. Ultrasuede may not be the actual fabric according to certain sources, but it's probably the closest in color, weight and texture in today's fabric market. I went on their website and they have colors that look very close to what some of us might need or want to make uniforms with. Of course, not knowing what today's prices will cost, but it's still a good choice. doing a quick search, Ultra Suede is about $50 a yard, while the buter suede is $6 a yard. I'd say for uniforms (the tans and the blues) The Butter suede might be the better choice, since the color matches decently. Doing the entire uniform in Ultra Suede would make doing it at home more expensive then buying one of the available Costumes. Oh the buttersuede is definitely too light as is. The originals were HEAVILY interfaced. They also and they had the lining added on top of that then the piping. The originals are heavier than any replica I've ever seen. The jackets are almost as heavy as a motorcycle jacket. I was really surprised. Hancock also carries "stretch" suede which is way off. The main thing with the ultrasuede is the pile and feel. The buttersuede has the right look to it, the right feel (very slightly course to the tough, but still "suedeish") and is pretty darn close to the real thing which was a suede cloth. I agree though, ultrasuede would be cool. Might be easier to find the correct color as you said. Though I still haven't found it! I'm actually more concerned with the color and the weight than the exact match of fabric. In the end I suppose it is personal preference. Are you planning to make a uniform our of ultrasuede Bryan? Yeah, I think that would put us up at about $800 or so just in fabric. Not counting buckles, braid, lining, or patches. Throw boots in, belt, gun belt, and a blaster and you're well over grand. I love the stuff and I think it would wear great. It would also be durable, but I know I can't afford it. The screen used items I got to examine a few years back at the auction were definitely not made of ultrasuede. I've heard "contour suede" was what they used as well. Gary's Upholstery has some suede cloth that looks pretty decent color wise. Its not cheap either at around $35 a yard. I'm actually thinking about custom dying some buttersuede. I've got some extra tan that is very light. Might cut a yard of it up into swatches and trying different dye mixes. Could turn out interesting! Reaper invited me to come join. Someone sent me a private email and wanted to see what my blaster looked like.